After reading the guide last night, I was planning to go to The Deck, on Southbank. It was stated in the book as open on Sunday’s. But alas, I went there with no luck. I was disappointed. Where to now ? I didn’t have my book with me, and the Age Good Food Guide (goodguides.com.au) is under maintenance. I couldn’t access anything to search for another restaurant. After walking aimlessly around, I finally decided on The Ludlow Formation. It looked busy, and thought I would give it a try. It was getting late, and I had even tried to go to Maze, though this doesn’t exist anymore (I had heard they had breakfast). The tank was empty, therefore Ludlow it was. The menu was straightforward. Nothing that really stood out. 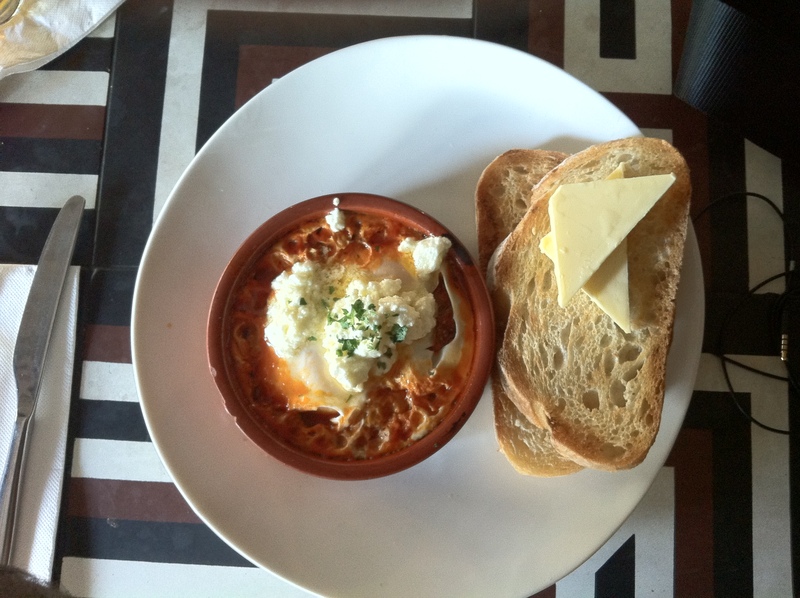 I decided on the baked eggs, with Chickpeas, fetta and Turkish Soldiers. Turkish soldiers just ended up being bread and butter, and more so, cold/warm toast. A shame. I have to say, the way it looked even did not compare to Cumulus or Circa. It was like the method they used was totally different. Could have been the temperature or the style used. It simply was not as good as Circa or Cumulus. The taste was inconsistent, which may have been contributed by the saltiness of the fetta. I enjoyed the one at Kamel more so. The taste wasn’t too bad though. It was ok, though definitely no Circa or Cumulus. Rating – 4.5 Could have been better.